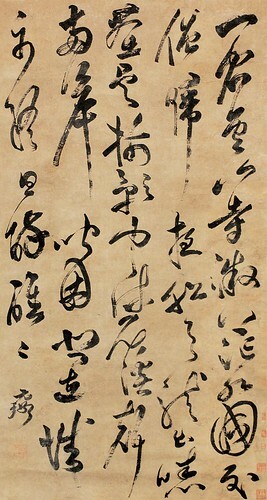 Ni Yuanlu (倪元璐, 1592-1644) was a calligrapher in the late Ming Dynasty. He was a native of Shangyu (上虞), ZheJiang Province.His courtesy name was Ruyu (汝玉) and his pseudonym was Hongbao (鴻寶). Ni passed the imperial civil recruitment examination with distinction, and then became an official. He was skillful at calligraphy, as well as painting. Both his calligraphy and painting are praised for their archaic and refined dignity. Ni leaves ample space between the lines and writes his calligraphy in powerful and tense brushstrokes. The contrast of his use of the wet and dry brush is exceptional. Ni Yuanlu was a loyalist and died for the Ming Dynasty upon its fall.